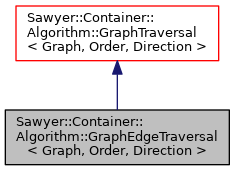 Base class for graph edge traversals. Edge traversals increment their current position stopping only when an edge is entered. They have dereference ("*") and arrow ("->") operators and a next method that return edge nodes from the graph. Definition at line 1116 of file GraphTraversal.h. Return reference to current edge. Definition at line 1122 of file GraphTraversal.h. Return pointer to current edge. Definition at line 1127 of file GraphTraversal.h. Return reference to current edge and advance. Definition at line 1132 of file GraphTraversal.h.